Thanks for you interested and pre-orders, but we decided to not run the Ts. Joey’s still ok, though! Spent the afternoon with these two American Apparel models. The dude hadn’t ridden a bike in years and she refused to put pants on, but the tee artwork, survey, photoshoot (uhm ‘shopped), is done. The tees are ready for pre-orders today. The tees are American Apparel, Organic cotton in Natural with Kelly green stitching and a 2-color screen print of the artwork. They cost $28.00 + $5.00 for shipping. They tees are made in LA and screened right here in Seattle. They’ll ship in about 2 weeks, after the orders come in, with a free barrier sticker based on the artwork. Check sizing on American Apparel’s site. 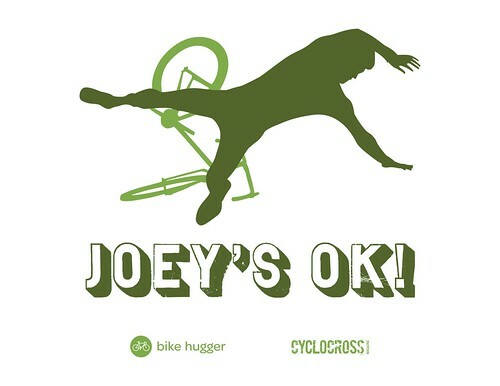 Note: we decided to NOT run Joey’s OK Tees. The artwork was hand-drawn and designed by Scott Benish. It’s based on Jaxon Suttlemyre’s photo. In collaboration with Cyclocoss Magazine, we’re giving the art away. as long as you attribute the original work to Bike Hugger, not use it for commercial purposes, and also share it. Download it here. The file contains .ai, .pdf, .eps, a license, and a link to the font. Maybe there’s a Joey’s NOT OK! Halloween character that wrecks havoc in a race? Who knows and whatever you want to do, have fun with it. It’s been fun for us and Joey. The video is playing on Dutch talk shows now. Also, Joey’s gonna get paid for the Tees and will save his royalties for a new road bike or a waterbed.